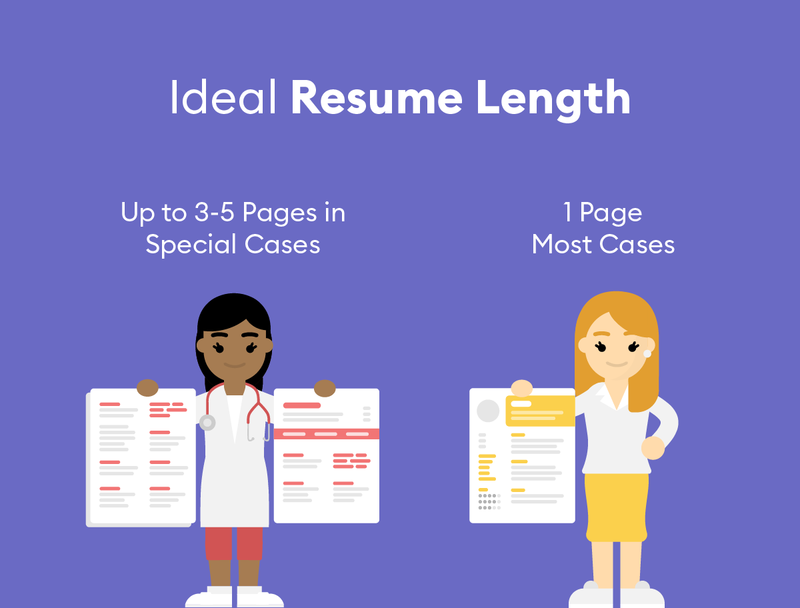 An ideal resume should have within 1 to 3 pages. After searching the job boards for what seems like an eternity, you finally stumble upon a job that’s exactly what you are looking for, and it’s time to submit your resume for consideration. As you’re updating your resume for this dream job, you might be wondering how long your resume should be, and you aren’t alone. Many people say that resumes should be no longer than one page. However, it’s critical that you don’t leave out valuable information in your quest to keep your resume to a single page in length. The answer to the question of resume length is simple and convoluted all at the same time: your resume should be as long as it needs to be to demonstrate that you are the best person for the position. The point of your resume is to highlight your experiences as they relate to the position you are applying, and every piece of content should demonstrate why you are the best choice. As a hard and fast rule, if you're a recent graduate or professional with less than five years of experience, you will want to keep your resume to one page. More experienced professionals and senior-level executives can expand to two-three pages. You want to customize your resume based on the position you are applying, and only include relevant experiences that demonstrate your qualifications for the job you are seeking. Concise statements are equally important. Hiring managers typically have mere seconds to scan your resume and determine if you will be a fit, so you want to put your best foot forward. Include your best achievements and applicable positions that will prove you are the best candidate. While the length of your resume is important, the content is what sets you apart from other candidates. Practice brevity and only include positions or experiences that are relevant to the position you are applying. Your high school paper route does not need to be included. Similarly, if you're an experienced professional, you can remove your college extracurriculars. Anything over 15 years old can be excluded from your resume, as you likely have newer skills to showcase. The exception to this rule is if you are a recent graduate or if you are seeking a job in a different industry. If you held a college internship or were a member of an organization many years ago, but those experiences apply to the position you are seeking, then you will want to include them on your resume. For the sake of brevity and clarity, it's important only to include appropriate achievements for each previous position and feel free to utilize bullet points. Writing out your day-to-day responsibilities will take up far too much space on your resume and will not set you apart from other hopeful candidates. Instead, use simple bullet points and highlight relevant and measurable achievements. Grew sales by 15% from 2016 to 2017. If you do not have any measurable achievements to call out, only include things that relate to the position you are applying. If training and leadership is an integral part of the job, include those experiences on your resume. Introduced and trained all 25 staff members on a new software system. These experiences and achievements will show that you have experience in the industry and you are adequately prepared for the position you are seeking. Once you’ve included all relevant experiences and positions, then it’s time to edit. You’ll want to comb through all the content with an eye towards cutting. If any unnecessary words aren't adding value, cut those out. If there are redundancies, cut those out. Everything written in your resume should serve a purpose and aid in your goal of securing the position. Gone are the days where hiring managers want to know what’s in it for you, they’re only looking for how you can serve the company and if you will add value to the bottom line. The now archaic inclusion of a resume objective is no longer customary, so nix that entirely. Pay attention to experiences and bullet points that you can combine. This will free up valuable space to include other notable achievements. Responsible for all hiring of staff members. Oversee onboarding and training processes for all new employees. Responsible for hiring and onboarding all staff members. Once you have the content nailed down, look at the page(s) of your resume. Will the amount of text be overwhelming for a hiring manager? Is the font size to small? You can certainly adjust the margins and font size to keep your resume to fewer pages, but you don't want it to be so little that the page is littered with small copy. Make good use of white space and remember, your resume can be longer than one page if everything you decide to include aids in your campaign to secure a position. White space can help you organize what's most important on your resume to direct the hiring manager's eye to specific areas. Look at the example below, which uses bullet points and columns to organize the content in a way that is easily digestible for the reader. Don’t go crazy with your resume design but do focus on what’s most important and use variances in copy and bullet points to emphasize the things you feel will secure your opportunity for an interview. When deciding how long your resume should be, keep in mind that you need to practice brevity and only include information that is relevant to the position to which you are applying. If you are new in your career, your resume should be no longer than one page. However, your resume can bleed into more than one page if you are more experienced and have more relevant experiences to highlight. Eliminate those old high school or college jobs unless they are essential experiences concerning the position you are applying. Otherwise, keep it short and straightforward so the hiring manager can quickly determine if they should bring you in for an interview. The interview process is where you will have the opportunity to elaborate on the experiences on your resume, so good luck!